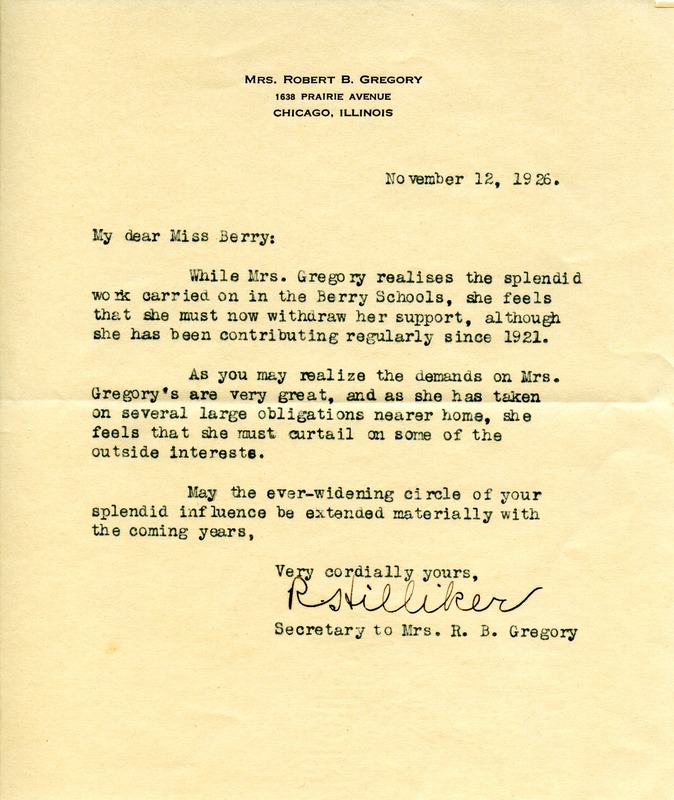 R. S. Lilliker, secretary to Mrs. R. B. Gregory, writes to Martha Berry to tell her that even though Mrs. Gregory has been regularly donating since 1921 and realizes the good work of The Schools, she must withdraw her support. Mrs. Gregory has too many demands on her and has taken on several obligations. R. S. Lilliker, “Letter to Martha Berry from R. S. Lilliker.” Martha Berry Digital Archive. Eds. Schlitz, Stephanie A., Chelsea Risley, et al. Mount Berry: Berry College, 2012. accessed April 26, 2019, https://mbda.berry.edu/items/show/2061.